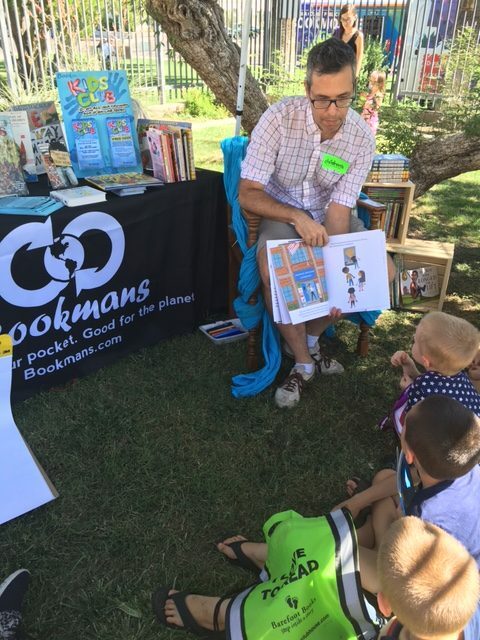 This past weekend Bookmans was fortunate enough to attend Love of Literacy at the Tucson Children’s Museum. A day guaranteed to ignite the joy of reading for families of the Tucson community. The event was filled with fun and reading from local acclaimed authors like Adam Rex and Enrique Feldman. There was performance story telling with Stories That Soar, book giveaways at the Bookmans tent and of course the museum itself, where admission was free and learning was imminent. We couldn’t have asked for a more fun-filled afternoon as we shared some of our own favorite stories with the Love of Literacy attendees. Love of Literacy is one of many fun events that take place at the Children’s Museum. S.T.E.A.M Sundays offers discounted admission rates and an all day emphasis on Science, Technology, Engineering, Art and Mathematics or Family Brain Boost where everyone can enjoy hands on science activities every Saturday at 1pm. The Tucson Children’s Museum offers a wide variety of creative, fun and educational exhibits guaranteed to get your child excited to learn. Whether it’s Techtopia, Ivestigation Station or Bodyology, (where you can literally stick your hand up a giant nose and feel boogers – so gross but SO COOL! ), the Tucson Children’s Museum has something for even the most reluctant little one. Don’t believe us? Try it out for yourself. Bookmans, in partnership with Tucson Children’s Museum, is giving away a family four pack of tickets to this one of a kind museum. To enter simply tell us in the comments below what exhibit you and your family are most excited to visit. Is it the Electri-City or Imaginarium? We want to know! The winner will be chosen using Random.org. We will allow 24 hours for commenting and winners will be notified via email on Wednesday, September 21st. Comments are moderated and may take some time to appear. Please do not resubmit your comments — one is plenty. For more information on the Tucson Children’s Museum, we encourage you to check out their website where you can learn more about this amazing organization and what exciting projects they have in store. Most excited to visit all of the exhibits, I am still looking forward to my first visit. My granddaughter is the craftsy one – she’ll head straight for the Imaginarium while her brothers check out the Investigation Station and Techtopia. The boys would be transfixed at Build It, while my daughter would love the creative options at Imaginarium! This would be fun while their cousin is visiting. I love shopping at the grocery store. This gives me healthy ideas with what I want in my school lunch, but my mama w would want me to practice my math skills. My son would go crazy for the Investigation Station. He’s really hoping we win so he can check it out!